Dental implants, a majority of the time, are the most predictable and desirable option to replace a single tooth or multiple teeth. They provide individuals with restored function and a long-term, esthetically pleasing result and with more comfort than alternative options. Before implants were available, patients chose bridges, partial dentures, and full dentures for replacement of missing teeth. If interested in dental implants, a referral is not necessary. Patients can contact us directly. In our practice, Dr. Jason Johnson has received additional training in the preparation, placement, and maintenance of dental implants including a three year residency at the University of Minnesota. He continues to enhance his skills through continuing education and leads a local dental study group. We use onsite advanced 3-D imaging, provide personalized care tailored to each patient's needs, and consistently experience long-term success with our dental implants. They act and feel like natural teeth and, with proper maintenance, dental implants can last a lifetime. They have no risk of developing cavities. Unlike a bridge, dental implants do not rely on adjacent teeth for support thus reducing stress on natural teeth. In addition, the abutment teeth used to support a bridge must be reduced to fit a crown over the natural tooth. Why compromise two teeth to replace one if it isn't necessary? They can also be placed to support a bridge and eliminate the need for a partial denture. Unhappy with a loose or ill-fitting denture? Again, dental implants could be the answer. Multiple implants can be placed to support a full denture. Maintains facial structure and appearance. Dental implants have become today's treatment of choice and standard of care for replacing a single tooth. Past options were limited to bridges or partial dentures which eventually needed replacement and required modifying adjacent teeth. A single dental implant does not compromise the health of nearby teeth, as other options might. An implant substitutes the root structure of a missing tooth. It helps to preserve bone, tissue and surrounding teeth which otherwise will deteriorate. Dental implants look, feel and act like natural teeth. 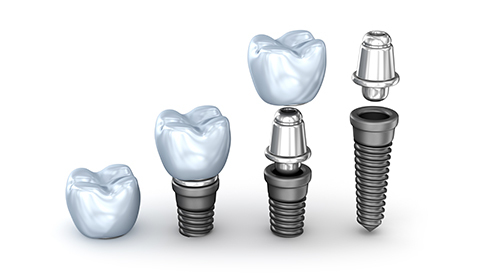 A dental implant is a threaded titanium post (root form) placed into the jawbone to replace a missing tooth root. Titanium is the preferred metal because it is biocompatible and fuses well with living bone. Once appropriate healing and integration of the implant has taken place, the implant is restored with a natural looking crown by your dentist. Depending on the complexity, additional healing times and appointments may be necessary. 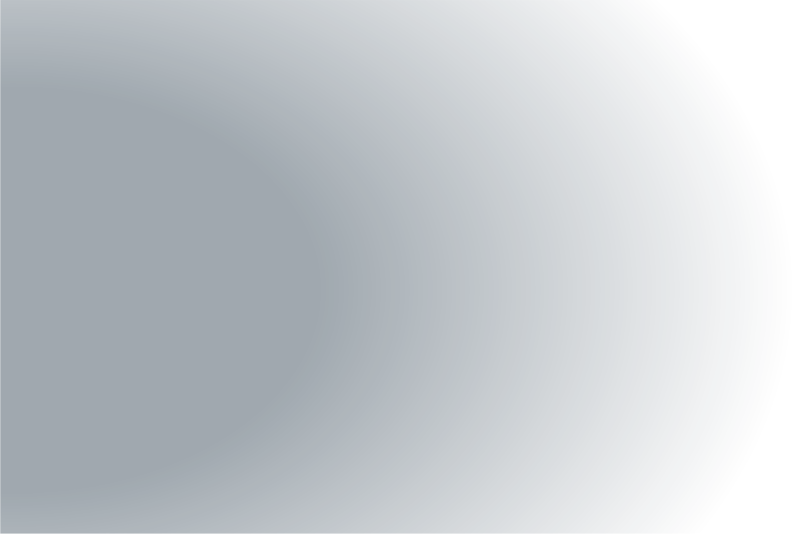 Our offices works closely with your dentist during the entire implant process. While dental implants have no risk of developing cavities, they are still susceptible to periodontal (gum) disease. It is very important to keep the bone and tissue healthy around the implant by daily brushing and flossing. Along with good oral hygiene, visit your dental professional for regular cleanings and exams. With proper maintenance and home care, implants can last a lifetime. Dental implants are the most preferred tooth replacement option for dentist and patients alike. The advancement of dental implants provides patients with many options to have natural-like, long-lasting teeth. Multiple dental implants can be placed next to each other, can be placed in various sites of the mouth, or can be placed as anchor/abutment implants to support a bridge. Unlike partial dentures or bridges, dental implants feel like natural teeth, preserve bone and tissue, are easy to care for, are safe for adjacent teeth, and are comfortable. 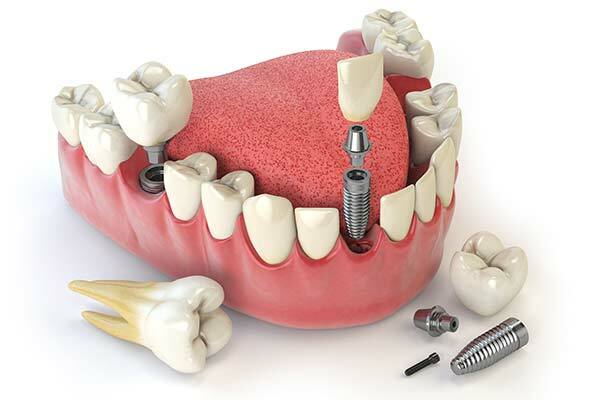 Dental implants, themselves, are threaded titanium posts (root forms) which are placed into the jawbone. Titanium is the metal of choice for dental implants because it is biocompatible and fuses well with living bone. After appropriate healing and integration of the implants has taken place, the implants are restored with implant crowns or an implant bridge by your dentist. Throughout the entire implant process, we will work as a team with your general dentist and communicate regularly. In the past, individuals with missing teeth were stuck with partial dentures and dentures as the only replacement options. Often plagued with painful sore spots or the embarrassment of dentures feeling loose or falling out, denture wearers would become malnourished and have feelings of insecurity. 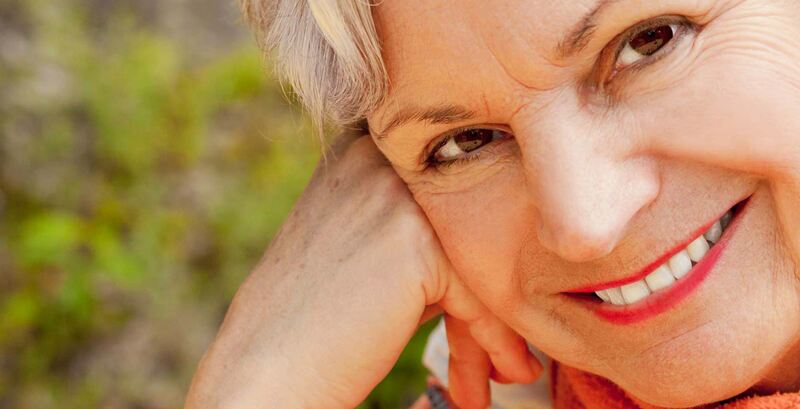 With the modernization of dental implants, patients are experiencing dramatic, life-changing results. Not only do implants preserve the jawbone, they help to keep facial structure and appearance. Today, patients are having implants placed to support a bridge (fixed partial denture) replacing one or more multiple teeth in the same area. 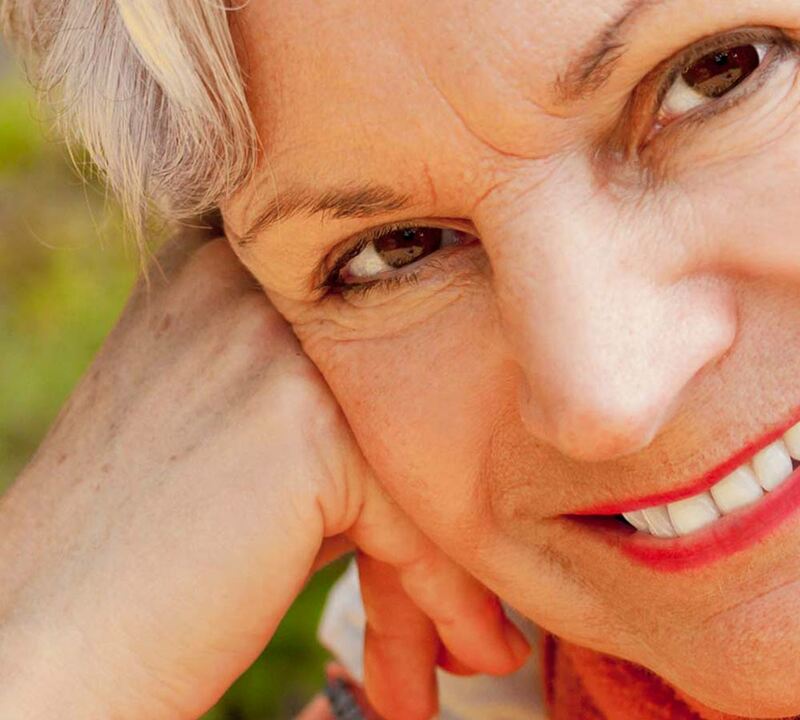 Full dentures also have the option of fastening to multiple dental implants for support. With added stability, a denture will no longer float around or fall out when eating or speaking. And, no denture adhesive needed! Implants can significantly improve the fit and function of a denture and dramatically improve quality of life. Dental implants are threaded titanium posts (root forms) which are strategically placed in the jawbone at multiple locations to anchor a denture. Titanium is the metal of choice for dental implant because it is biocompatible and fuses well with living bone. After appropriate healing and integration of the implants has taken place, the implants are restored with an implant bridge or denture. With most implant supported dentures, there is an attachment device for the denture to clip onto. This is dependent on the number of implants placed and your restorative plan. Throughout the entire implant process, we will work closely with your dentist until final restoration is complete. An implant evaluation is the first step in determining if a patient is a candidate for dental implants based on his/her oral condition and health history. Very rarely is an individual not able to have dental implants. Dr. Johnson completes a thorough evaluation, discusses treatment options, may recommend further diagnostic imaging, and prepares and individualized treatment plan. One of the keys to implant success, is having high-quality and quantity of bone where the implant(s) will be placed. For some, an implant can be placed at the same time as removal. If bone has been lost from a previous extraction or periodontal disease, there is a likelihood the site is deficient in bone. Another area of concern, is the upper molar area where the sinus membrane is in close proximity to the jawbone. In cases of insufficient bone or sinus membrane interference, bone grafting and regeneration will be necessary. Anatomy can vary with each patient and for certain cases a sinus graft or bone graft can be done at the same time of implant placement. Once bone grafting, also known as sinus lift/augmentation or ridge grafting/augmentation is completed, the area will need appropriate healing and integration time. Bone grafting procedures are completed in the office using local anesthetic. Patients are comfortable during the entire appointment and experience minimal discomfort following the procedure. After a healing period of 3-6 months, depending on the type of bone graft, a radiograph or 3-D scan will be completed to verify the quality and quantity of bone prior to proceeding with implant placement. The dental implant procedure is completed in the office using local anesthetic. Patients are comfortable during the entire appointment and experience minimal discomfort following the procedure. 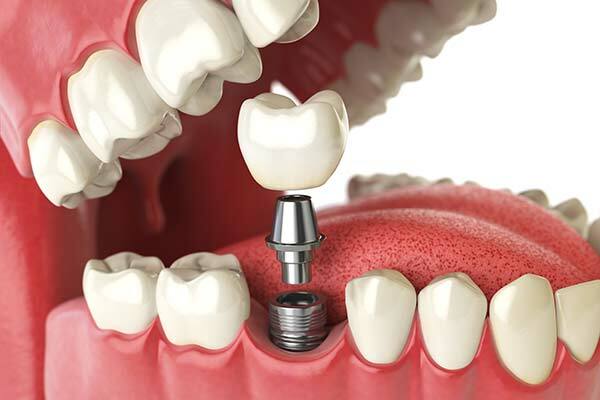 The dental implant is a threaded titanium post (root form) which is placed into the jawbone. Titanium is the metal of choice for dental implants because it is biocompatible and fuses well with living bone. During healing time of 3-4 months, a temporary replacement option can be used if desired. After appropriate healing and integration of the implants has taken place, your dentist can attach an abutment (extension) to the implant. The abutment is a small metal post that will be the foundation of your crown, bridge, or denture. The finishing step is having your dentist complete the restoration. Throughout the entire implant process, we will work as a team with your general dentist and communicate regularly. No matter the simplicity or complexity of an individuals case, the difference is amazing!